T.S. Eliot struggles against his family’s temperament. I sent you a few days ago by registered post a copy of my portrait (the one Knopf is using for advertising) and a copy of my limited edition. I have not sent this to Mother or told her about it. I thought of cutting out the page on which occurs a poem called “Ode” and sending the book as if there had been an error and an extra page put in. Will you read through the new poems and give your opinion. The “Ode” is not in the edition that Knopf is publishing, all the others are. And I suppose she will have to see that book. Do you think that “Sweeney Erect” will shock her? Some of the new poems, the Sweeney ones, especially “Among the Nightingales” and “Burbank” are intensely serious, and I think these two are among the best that I have ever done. But even here I am considered by the ordinary newspaper critic as a wit or satirist, and in America I suppose I shall be thought merely disgusting. I am grateful to you for giving me so much news of mother. She gives it herself only in a vague and fragmentary form. I am interested in your suggestion that she ought to put the Mercantile Trust Co. in charge. I am always wondering whether it is really necessary for her to take so much upon her own shoulders, or whether it is not merely the family temperament—to do everything oneself and to put on climbing irons to mount a molehill. I am not in the least surprised at Uncle Ed, and the sooner she gets good lawyers, brokers, estate agents, and bankers and has nothing to do with Ed the better. I have just written to her: I want her to take her summer holiday here in England instead of in Boston. I can see nothing against it. She will have to leave St. Louis anyway for three months. She does not want to come to England until her estate is settled. I cannot believe that she would stand any serious financial loss by a few months’ absence, with you in Chicago and good agents in St. Louis. I cannot believe that the difference between twelve hundred miles and three thousand miles matters so much as that. I know she wants to come; I am sure that it would do her a world of good, not only seeing me and seeing how I live, but the voyage, the change, the getting away from old scenes. I cannot see that expense, compared with the expense of my coming to America, can count at all. For she would be able to live in comfort here for much less than at home—the cost of living is less, and the rate of exchange would make her money go much further. 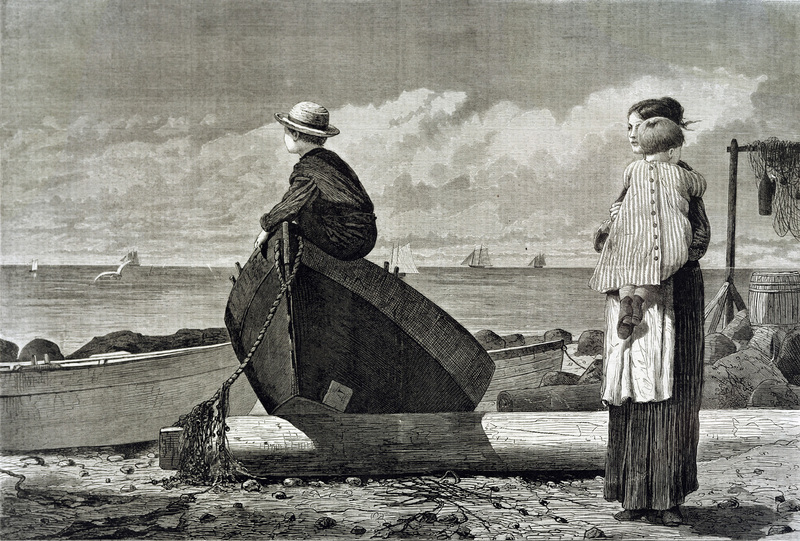 Dad’s Coming, by Winslow Homer, 1873. Boston Public Library, Print Department, Massachusetts. The only thing that I think is holding her back is the family fear and conscience—the feeling that she ought not to leave her business matters even for a short time lest something (unknown) should happen, and she might then have less to leave to her children. And the same feeling will make her go on postponing and postponing until it is too late. Consider my position. I am thinking all the time of my desire to see her. I cannot get away from it. Unless I can really see her again I shall never be happy. Now if I come to America, it will be nothing but haste, worry, and fatigue. I can get, at most, ten or possibly fourteen days with her. We should be thinking of the end the whole time. Now why should not mother come here while she is physically able, and keep my visit to America until she is no longer strong enough to come? I feel sure that if mother could see things in the true perspective, look ahead and not see, in the Eliot way, only the immediate difficulties and details, she would make up her mind at once and come this summer. I feel that I am struggling not against real material obstacles but against the family temperament. And I seem to see the relatives lifting up their eyes piously and saying that it is my duty to come to mother, and not proper for mother to come to me. As if it were filial piety to see her for ten days instead of ten weeks. Will you try and look at this in a large perspective, even if no one else will, and then try to help me? This has been the greatest problem on my mind ever since peace. I must stop now. I will write again soon. From a letter to his brother. Born the youngest of seven children in 1888, Eliot graduated from Harvard University in 1909, befriended Ezra Pound in 1914, and married Vivien Haigh-Wood in 1915. He wrote his brother in 1916, “The present year has been, in some respects, the most awful nightmare of anxiety that the mind of man could conceive,” although he later recalled that his first marriage also brought him “the state of mind out of which came The Waste Land”—the modernist poem cut from eight hundred lines to 433 by Pound and published in 1922.